Volkswagen AG subsidiary Seat wants people who climb inside its new mid-sized Exeo sedan and Exeo ST station wagon to keep cool even when it is hot. One of the car's comfort features is Webasto AG's optional solar sunroof, which helps maintain the cabin at an ambient temperature in hot weather, something people in Seat's Spanish home market deal with often. Should the interior become significantly warmer than outside, the German supplier's system triggers the opening of solar-powered air vents in the cabin. French glass maker Saint-Gobain Sekurit also helps prevent internal temperatures from rising too high by providing a heat-reflecting windshield. The windshield comprises an invisible silver coating interposed between two glass sheets. Denso Corp., Maflow S.p.A. and TI Automotive Ltd. all contribute to the Exeo's air conditioning system. 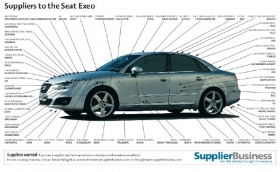 Seat unveiled its Ford Mondeo and Opel/Vauxhall Insignia rival at the 2008 Paris auto show. The Exeo, which marks Seat's entry into the mid-sized segment, is based on the previous-generation A4 from sister brand Audi. However, it is not just a re-badging of its VW sibling. About a third of the Exeo's parts are different from the A4's.